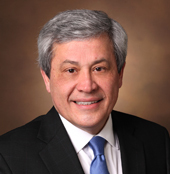 Carlos L. Arteaga, M.D., the Donna S. Hall Professor of Breast Cancer and director of the Center for Cancer Targeted Therapies and the Breast Cancer Program at Vanderbilt-Ingram Cancer Center (VICC), has been recognized for his cancer research efforts by the American-Italian Cancer Foundation (AICF). The AICF will also honor Frederick Alt, Ph.D., a Howard Hughes Medical Institute Investigator and director of the Program in Cellular and Molecular Medicine at Boston Children’s Hospital. Alt is the Charles A. Janeway Professor of Pediatrics and professor of Genetics at Harvard Medical School. A day after the Benefit Dinner, a research symposium will be held at Memorial Sloan Kettering Cancer Center where each of the awardees will give a presentation on their work. Arteaga will receive the 2015 Prize for Scientific Excellence in Medicine at the 35th Annual AICF Benefit Dinner to be held Nov. 10 at the Mandarin Oriental Hotel, New York City. The prize was established in 1984 to recognize groundbreaking discoveries in cancer biology, prevention, diagnosis and/or treatment. The AICF is a nonprofit organization whose mission is to support cancer research, education, and control, emphasizing the resources of Italy and the United States. The group works to highlight leading-edge scientific excellence in medicine and serves economically disadvantaged, medically underserved women in New York City through breast cancer screening, outreach and education. “This is a wonderful and unexpected honor and I am deeply grateful for this recognition of my research on the underlying molecular changes that contribute to the progression of breast cancer and which may lead to effective therapies,” said Arteaga who also serves as associate director for Clinical Research at VICC. Arteaga recently completed a year as president of the American Association for Cancer Research (AACR), the largest cancer research organization in the world. As immediate past president, Arteaga served as moderator for a meeting with members of Congress in Washington, D.C., to discuss precision medicine in cancer. The initiative led by the AACR and the Fellows of the AACR Academy was designed to stimulate additional support for President Barack Obama’s Precision Medicine Initiative. Arteaga was named a Fellow of the AACR Academy earlier this year. Arteaga has more than 250 publications in the areas of signaling by oncogenes and growth factor receptors in breast tumor cells, development of targeted cancer therapies and biomarkers of drug action and/or resistance in breast cancer and investigator-initiated clinical trials. His research is funded by the National Cancer Institute, American Cancer Society, the Department of Defense Breast Cancer Program and the Komen and Breast Cancer Research Foundations. He is the recipient of many honors and awards, including the AACR-Richard and Hinda Rosenthal Award, the American Cancer Society Clinical Research Professor Award, the Gianni Bonadonna Award from the American Society of Clinical Oncology (ASCO), and the Brinker Award for Scientific Distinction from the Susan G. Komen for the Cure foundation. He is an elected member of the Association of American Physicians and the American Society for Clinical Investigation. Arteaga received his medical degree in 1980 from the Facultad de Ciencias Médicas at the Universidad de Guayaquil in Ecuador. Following internal medicine residency at Emory University in Atlanta, he completed a fellowship in medical oncology at The University of Texas Health Science Center at San Antonio. He joined the faculty at Vanderbilt University in 1989.